Brainfuck Developer is a Win32 tool for writing, debugging, and (in some degree) understanding Brainfuck programs. Its main feature is an integrated debugger with support for single-step trace, run-to-cursor, and interactive memory inspection. It is a development tool, not only a simple interpreter. With the "Watch Program Operation" feature, you can watch your BF code running to go get an impression what your program does. In addition, BFdev features "piping" input and output data to files. You can set an input file from which the input data is read, and an output file to which all output data is written (in binary). Given this ability, BFdev is just as powerful as console interpreters. Since version 1.4.0, BFdev supports the pbrain (procedural brainfuck) language extension. This extension adds three new commands to the BF language (as explained below). A very useful feature integrated in BFdev since version 1.4.6 is the Text Generator, a tool that generates BF code for printing text. There is nothing to say about how BFdev works. Everyone who has already worked with an IDE like Visual Studio, Delphi, or Turbo Pascal knows the basic functioning of BFdev. (To those who have not: do you really wanna code Brainfuck? ;) All of the program's functions are self-explanatory. 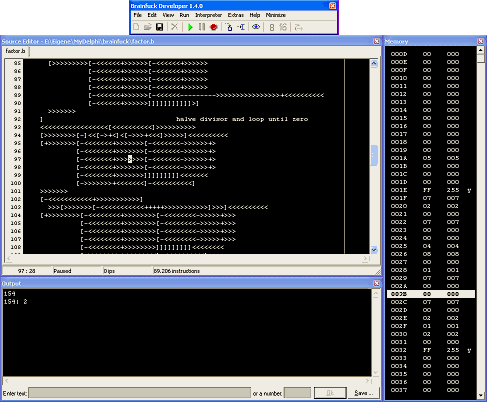 The screenshot to the right shows BFdev in debug mode, running "factor.b" by Brian Raiter. If the pointer leaves the legal memory bounds (underflow or overflow), wrap-around occurs. Procedural BF (pbrain) is supported. Stack size is 65536. BF interpreters often have a "bracket nesting limit". BFdev does not. It supports an infinite number of nested brackets (only limited by your available RAM). The interpreter ignores all characters in the code that are not Brainfuck commands. BFdev utilizes buffered output for printing. This increases performance since the slow API calls don't have to be made each time a single character is printed. Buffering may cause the output appear choppy, especially on slow computers. If a BF program is very slow, it may appear hanging, but that's generally not the case. The characters it prints are just not immediately shown on screen! You can change the buffer size or disable it by choosing "Set Output Buffer Size" in the "Extras" menu. Additionally, you could press F8 to pause the program and to flush the output buffer. Programs can indicate a new line by printing the characters LF (#10), CRLF (#13#10), CR (#13), or LFCR (#10#13). Under Windows XP, BFdev runs optimal. Under Windows 95/98, BFdev cannot produce output greater than 64 KB. This is due to limitations of the operating system (the Windows 95/98 multiline edit component is restricted to 64 KB). Brainfuck Developer is freeware. That means, you may distribute it freely, but only in "complete and unchanged state" and NOT ON YOUR OWN WEBSITE. BFdev is "complete" with the three files bfdev.exe, printer.b, and readme.txt, bundled in the original bfdev.zip file. FREEWARE DOES NOT MEAN PUBLIC DOMAIN OR OPEN SOURCE. I hold all rights. Why isn't BFdev open source? I cannot release BFdev as open source since the code is an embarassment for me. BFdev started as a very small project and was not meant to grow as it finally did. I added more and more functionality, but the architecture was not really capable of supporting this. The program appears small, but internally, there's more code than one might think. Bad code, unfortunately. I feel pain when looking at it. I should rewrite the whole thing. To webmasters: DO NOT link to the zip-files directly and DO NOT upload the files to your webserver! Instead, link to 4mhz.de or 4mhz.de/bfdev.html. Thanks. Feedback is always appreciated, especially if you encounter any bugs or have any ideas for the next version. If you want to print large amounts of text, use the Text Generator tool integrated in BFdev (in the "Extras" menu). Some programs run faster in 8-bit mode; others gain better precision in 16-bit mode. You have to check which mode performs better. Use Ctrl+F5 and Ctrl+F6 or Ctrl+Tab and Ctrl+Shift+Tab to switch between open documents. Some authors write their BF programs in such a way that they expect a CRLF line break rather than the standard LF when requesting input from the user. By default, BFdev sends an LF. If the BF program you're running doesn't behave as expected, try switching BFdev to "Report CRLF for line breaks when entering text" in the "Extras" menu. Infrequently, BF programs loaded from the internet don't work correctly. This is because some authors use comment markers for design purposes so that some code lines are not executed by BFdev. In this case, you can disable comment markers by unchecking the "Enable comment markers" entry in the "Extras" menu. pbrain means "procedural brainfuck" and enables you to define and call procedures in your BF programs. For this purpose, pbrain adds three new commands to the BF language: "(", ")", and ":". "(" starts definition of a procedure. This newly created procedure will be referenced with the value that's in the current memory cell. ":" calls that procedure that is referenced by the current memory cell. BFdev does not tolerate calling of undefined procedures. In this case, it will report an error. BFdev offers a stack of 65536 entries, that means you can nest procedures until a depth of 65536. There is no stack overflow checking. This doesn't mean BFdev crashes if the stack grows too big, but instead, your program crashes and you probably wouldn't know why. The IDE itself doesn't crash when the stack overflows (I cared for this). You can enable or disable pbrain support by checking or unchecking "Enable Procedural BF" in the "Interpreter" menu, by pressing Ctrl+P, or by clicking the pbrain button in the tool bar. This is a very informative Brainfuck page. Worth a visit. The pages of a quite competent Brainfuck coder. Frans Faase's Brainfuck page. Some interesting information. A Brainfuck archive. Brainfuck programs, interpreters, compilers, and sources of them to try.